Whoo, hoo! I just completed my first track day! 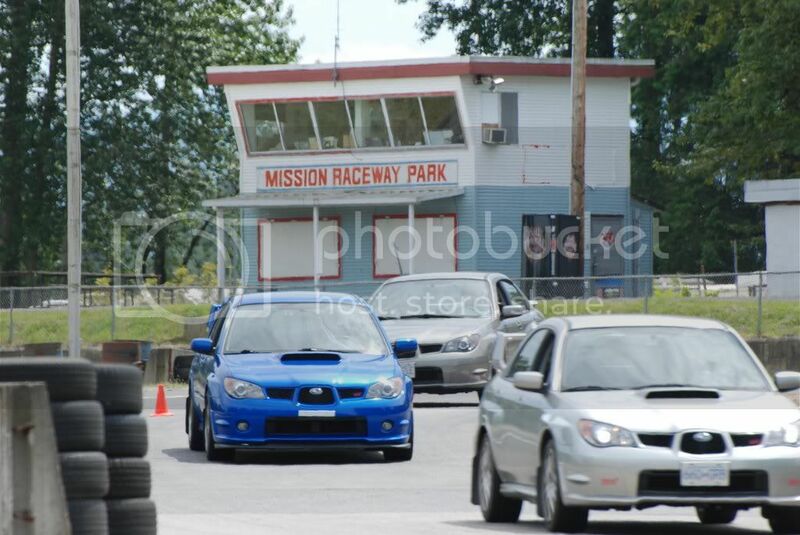 This was an event organized by Geremy from Specialty Subaru in North Vancouver specifically for Subaru owners. The instructors were from Driving Unlimited and I had an awesome time practicing techniques like heel/toe shifting and trail braking. Going down the straightaway hearing the roar of the boxer engine at full throttle had the theme music from Gran Turismo 2 playing in my head and put a huge grin on my face. ...the instructors began explaining basic concepts about setting up the proper seating and mirror positions on our vehicles. They also explained the three warm-up exercises that we would be doing on the track. Slalom: To practice our distance vision an instructor stands at the end of the slalom and signals when we need to skip a gate. Avoidance: Again to practice looking far in the distance, an instructor stands behind a cone barrier and as we approach, he signals the direction of our escape route (left or right) or signals a full emergency stop. Emergency Stop in Turn: We enter a curve at about 70 km/h and perform a full emergency/ABS stop while keeping our eyes forward in the turn. I've taken a couple of Driving Unlimited's Collision Avoidance Courses over the years (most recently last month) so I was familiar with what we needed to do--we just needed to do them at a higher speed. One of the instructors first lead us around the track for two laps so that we could get familiar with it. We did the exercises a few times before we were sent back to the tent for debriefing. After that, we got into groups of 3 or 4 and each of us took turns being in the lead car when the instructors drove our cars to show us the proper racing line and where we should be looking at each turn. Anyway, that was basically how the day went. I had filled up at the gas station near the track in the morning and afterwards I topped it up again. I found that I burned close to 29 L of fuel (almost half a tank) at a total cost of about $43. The cost of the full-day training was $298 which included a catered lunch. Overall, I had a great day and I'm ready to sign up for the next one!